Ah March Break. My favourite time of the year until I started university. A whole week off of school to sleep in, do touristy things with my family and watch as many movies as I could handle. What are your plans for this March Break? Would you like to win $250 USD PayPal cash to help you decide? 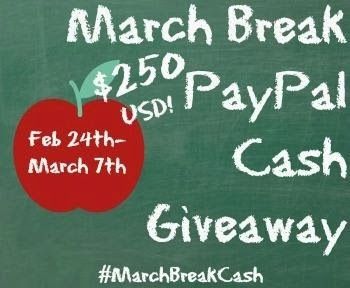 The March Break Cash Giveaway for $250 USD PayPal cash is open worldwide from February 24th- March 7th. The winner will be emailed as soon as chosen and will have 48 hours to respond before a new winner is chosen. All entries will be verified, so please ensure you are complete all your entries properly! A big thank you to Ninja Mommers (http://www.ninjamommers.com) for hosting this awesome giveaway! Good Luck! This giveaway is not sponsored by PayPal. My daughter's birthday is in March, so I would buy her birthday cake, clothing and dolls that she wants. We're looking to buy our first home and so I'd love to put it towards a new fridge or stove! I would like to use this money for doing some local day trips during March Break. I would use it to buy a new tripod. my sons 3 day hockey tournament. I would use it to take my kids shopping. We would use it to pay for the trips my two daughters are going on over March Break: Florida for one and London, UK & Paris for the other. I would use it to take my boys out to the movies!! It would be great for Gas money for a road trip around Ontario! I would use it to buy some books to read over March break. I would use it to buy some new books to read over March break! I would like to learn to play the guitar!! I'd love to be able to buy my son some clothing for spring and I'd use some to begin preparing to home school him. Niagara road trip with my kids. we are saving towards our first family vacation!